Cleanse day 5. Oh heck ya. We’ve done a full day of liquids, ate more veggies than we ever thought possible, and resisted cravings left, right and sideways. Nicely done! Make sure to check back over the weekend to view the meal plan for week two of our cleanse. Cravings got you down? You’re not alone. Just yesterday I wanted to sink my teeth into a juicy burger with bacon… and cheese… and a fried egg. I haven’t had a bacon and cheese burger for like, 10 years? But that’s all I wanted yesterday. Instead of getting angry and frustrated, I sat with the craving for a long while, asking myself why it was popping up. When I was able to tap into my intuition it was easy to see that my body was just craving more protein. I prepared a huge plate of sauteed kale with hemp seeds and the craving went away in a matter of minutes. Go for a walk. I know I have a tendency to snack after lunch so that’s when I take the dogs for a nice 15 minute walk. By the time I get back I no longer want that nibble of something sweet. Remind yourself why you’re doing this. I’m cleansing because I want my insides to feel good. I want to feel radiant. So, when I’m tempted by something that’s not on my cleanse program, I just remind myself why what I’m doing is important to me and that’s usually enough to set me straight. I’ve found that if you have a purpose and are emotionally connected to something, anything’s possible. Drink lemon water. 1000mL of water mixed with some fresh lemon juice always does the trick when I’m feeling a bit peckish. Make a healthy treat. 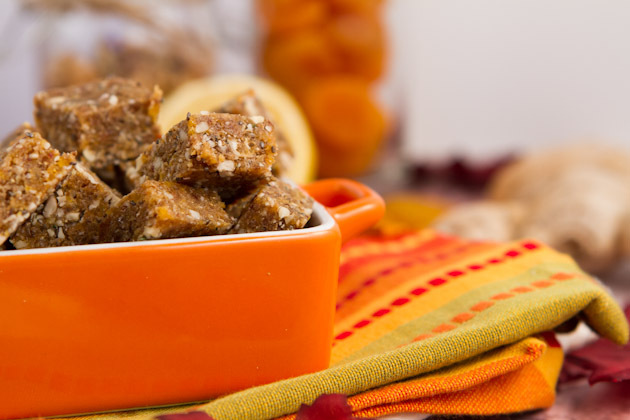 These chews are great as a little snack to hold you over until dinner, to satisfy your sweet tooth and give you a bit more energy to your day. Portion them out into snack bags and when you’re done the bag, you’re done snacking. Check yourself. Ask yourself, ‘Am I really hungry, or am I reaching for XYZ for emotional satisfaction? Why do I constantly crave this? How does it make me feel? What other things (non-food related) make me feel this same way? 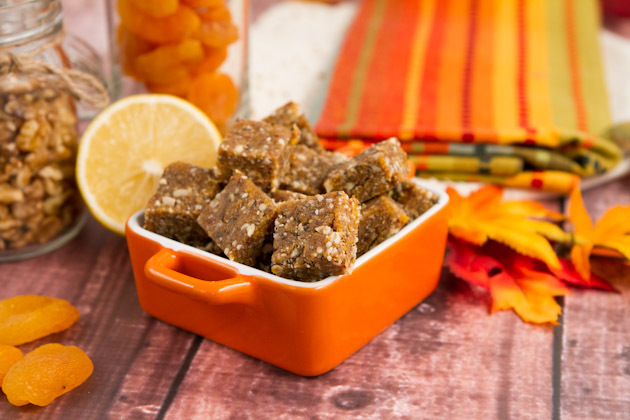 This snack was inspired by Navitas Naturals Power Snacks. I’d picked up a bag when I went to visit Ange last month and fell in love with the little bite-sizes morsels of superfood goodness. Of course as luck would have it, I haven’t been able to find them at home so I just decided to make my own! I would show you a picture of the actual power snack… but I gobbled up the bag in a week flat. 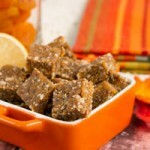 Jacked-up homemade dried fruit and nut squares with superfood power and loads of chia seeds. Made bite-sized to enjoy on the go. 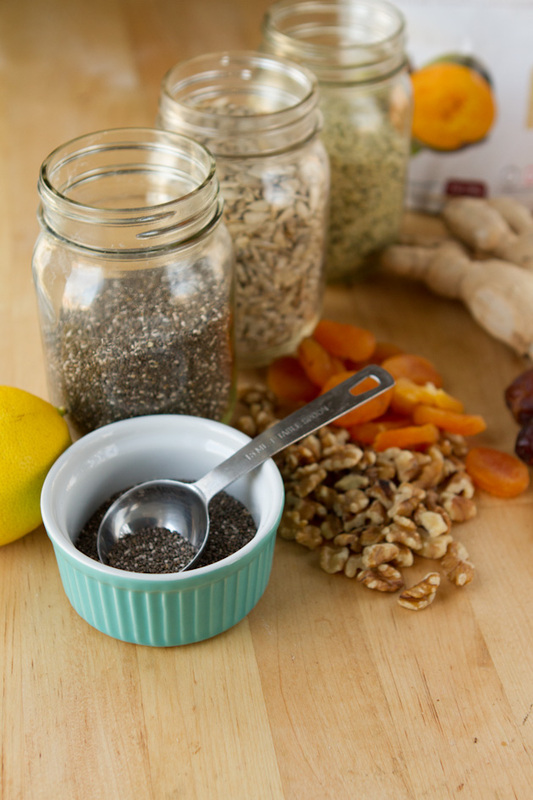 Combine chia seed and lemon juice in a small bowl. Stir to combine and leave to sit for 5 minutes. 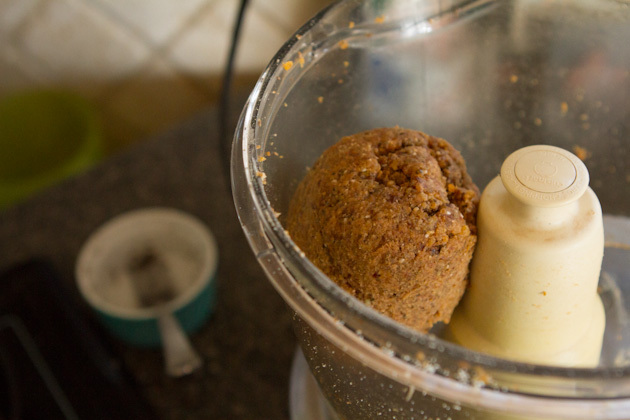 Add nuts and seed ingredients to the bowl of your food processor and pulse until broken down. Remove mixture from your processor and place in a large bowl. Set aside. Place dried fruit mix along with soaked chia (it will be a hard mass at this point, just scoop out with a spoon) in the bowl of your processor and process until smooth, about 3 minutes. It will form into a ball. This is good. 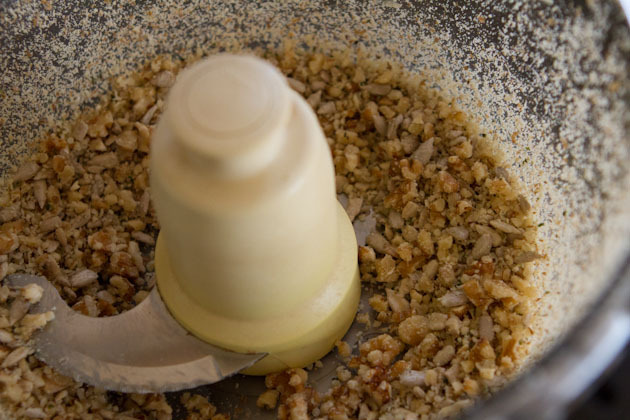 Once smooth, add the nut mixture to dried fruit mixture and process just until combined. 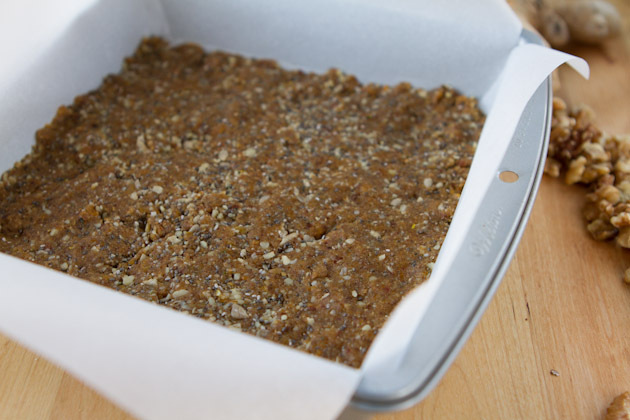 Line an 8x8 pan with parchment paper draping over both sides for easy lifting and drop the mixture into the prepared pan. Press and smooth out with a spatula. Fridge version: Place pan in the fridge for a couple of hours to harden. 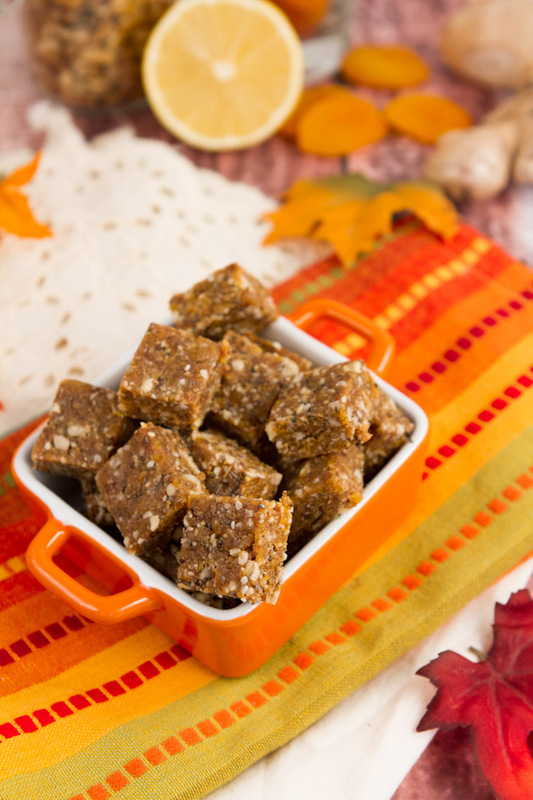 Remove, cut into cubes and store in the fridge or freezer until ready to consume. Dehydrator version: Place pan in the fridge for a couple of hours to harden. Remove, cut into cubes and place in your dehydrator. Dehydrate at 105F for 4 hours. You could be really creative with this recipe, too. There are so many potential flavor combinations to be had. I chose to go with ginger because well, it’s cleanse supporting and it goes fabulously with apricots. (I’m not sure what I was thinking when I bought a huge Costco-sized bag of dried apricots last week). Adding the lemon juice to the chia will help to soften it up a bit. Make sure that you don’t skip this step. You want the nuts and seeds to be broken down, but still have a bit of texture. I’m slowly starting to measure the ingredients for the recipes here on the blog starting with dried fruit! I was amazed at how many large, juicy dates I needed to get up to 200 grams. Add the nuts and seeds and process a bit more. Then press into the prepared pan and place in the fridge or freezer to harden up. They’ll be much easier to cut like this, believe me. If you have a dehydrator, it’s great to dehydrate the cubes for a bit just so that they’re a bit more portable and don’t stick together as much. 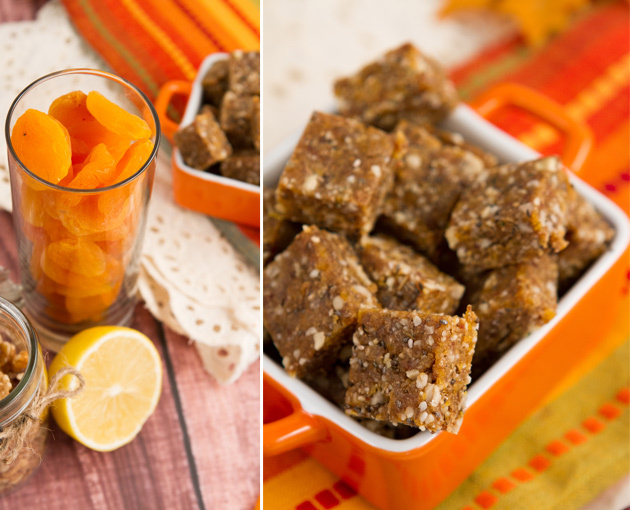 And there you have it, a cleanse-worthy snack that tastes good and will make you feel fantastic!